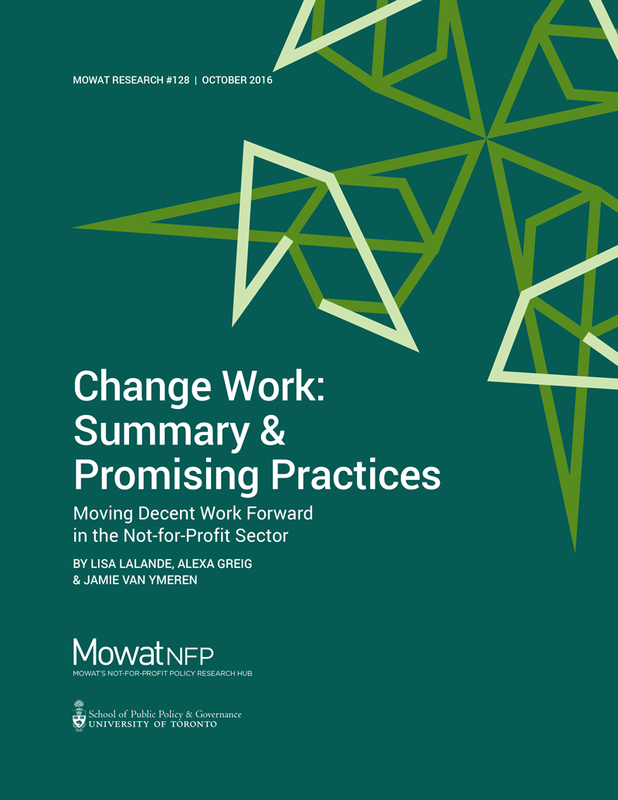 This report is a summary of the Change Work report that was published in November 2015 and includes six promising practices that NFPs can draw on when considering how to implement or advocate for decent work in their places of employment. Sharing promising practices is a jumping off point for exploring the potential for decent work in the NFP sector. There are many issues that affect the sector’s one million employees provincially: employment stability; low levels of pension plan and benefits coverage; high rates of part-time and contract employment; underinvestment in training and development; and poor work/life balance for workers. There is a need to improve working conditions for all – in the nonprofit sector and beyond. The decent work movement presents an opportunity for the sector to act as a champion of working conditions and social policies that not only ensure dignified and supportive work environments for employees, but also support the overall health and effectiveness of the nonprofit sector. Decent work can be a useful tool to create stable, equitable employment in the not-for-profit sector – and if it can be done here, there is the potential for it to be adopted in other sectors. Job precarity is a reality for many not-for-profit (NFP) sector employees. About 28 per cent of people employed by Ontario non-profits work part-time, 6 per cent work full-time but on time-limited contract, and another 13 per cent are employed part-time and on contract. Evidence suggests that job insecurity, lack of access to benefits and retirement income, and underinvestment in training and development are ongoing issues in the sector – employees feel passionate about their mission, but many suffer from poor work-life balance. However, the sector itself – often associated with passionate advocacy dedicated to protecting and advancing the interests of vulnerable people – can play a leading role in providing jobs that work better for people. Decent work is a lens for conceptualizing the possibilities presented by fair, equitable, and stable work. It offers an opportunity to ensure that the passionate objectives of the sector are supported by strong labour practices and a policy environment that enables these practices. In simple terms, decent work is a range of workplace elements, conditions, and characteristics that together make good working conditions. The International Labour Organization (ILO) defines decent work as work that delivers a fair income and social protections, security and equality of opportunity in the workplace, and prospects for personal development and social integration. There is currently no formal set of elements and quantitative indicators for decent work at the sector level – the ILO has focused its work on developing and measuring legal and statistical indicators for decent work at the country level. Based on our research and the ILO’s national elements, Mowat’s Fall 2015 report Change Work identified a non-exhaustive list of seven elements for discussion in the NFP sector.